Merry Christmas time to you! Hard to believe this year is coming to a close already. I hope you are enjoying a warm season full of love and peace. I wanted to share one of my favorite cookie recipes that are so minty and buttery, you won’t be able to eat just one. These are the perfect cookies for the holidays – festive and full of Christmas cheer. 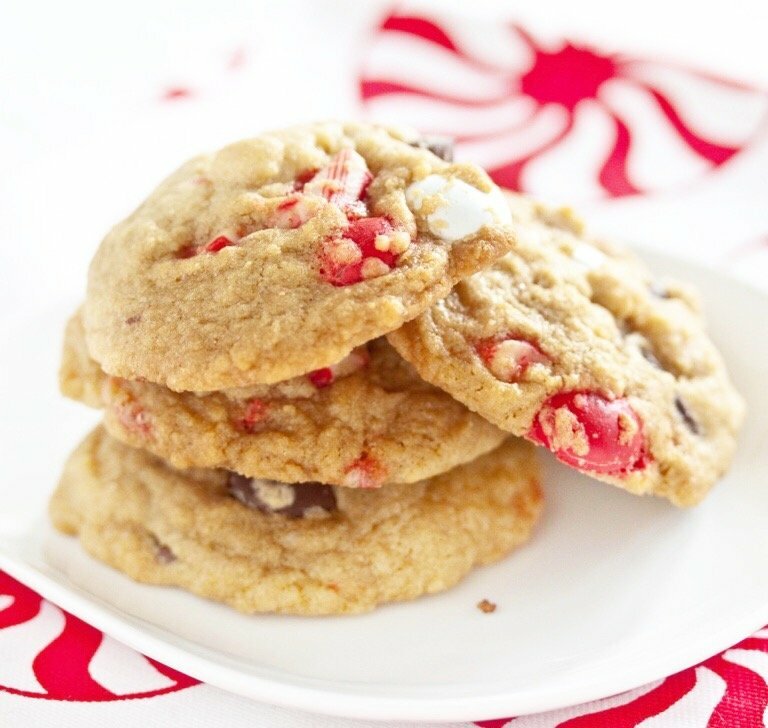 These are the perfect cookies for the holidays – festive and full of Christmas cheer. My sister is less of a peppermint fan and even she really liked these cookies. I like them so much that I’m afraid I’ll be craving them all year round. Don’t tell anyone, but I may just have to stash away some peppermint M&Ms and candy canes so I can make them again later. Enjoy and Merry Christmas! As I mixed the dough, I was certain it was going to be too dry. It just seemed like too much flour, but in the end it was just fine. There are several ways you can go about crushing the candy canes. I placed the candy canes in a large ziploc bag and wacked it with my rolling pin. Cream butter and sugars together in a stand mixer fitted with the paddle attachment until combined. Add eggs and vanilla and beat until smooth. Slowly mix in the dry ingredients. Stir in the chocolate chips, candy canes, and M&M’s.